From the Editor- "Speakeasies", The Angel’s Share- Featuring Brugal Especial Extra Dry Rum and Blue Chair Bay Coconut Spiced Rum, Bartender’s Corner- Early American Rum Cocktails (Part 3) . The Rum Historian "A Journey to Barbados- Part I: Drax Hall". 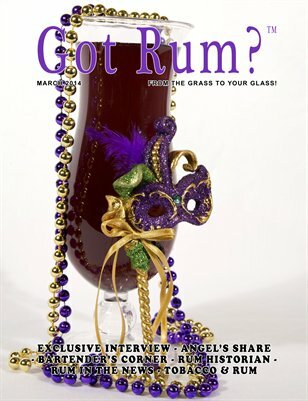 Rum in the News, Rum in History, Exclusive Interview-Louisiana Spirits LLC. Pairing Tobacco & Rum.